URGENT WARNING: Milwaukee Streets Unsafe for Bikers | Hupy and Abraham, S.C.
On July 26, 2018, Aaron Henning was riding his motorcycle east on St. Paul Street in Milwaukee. 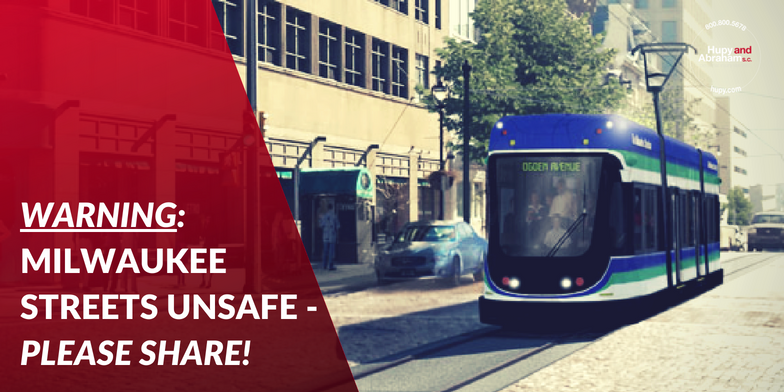 He was attempting to execute a lane switch to turn left on to Water Street when his front tire became lodged in the Milwaukee Streetcar (also known as “The Hop”) tracks, causing him to be thrown from the bike and land in the oncoming lane of traffic. Aaron sustained serious injuries from the incident, including a broken elbow, road rash and extensive damage to his motorcycle. Attorney and Firm President Michael Hupy has been a vocal critic of the streetcar from its inception stating, “We have buses that do what streetcars can do without endangering motorcyclists and bicyclists.” Attorney Hupy will be representing Henning in his case against the city of Milwaukee, the first of its kind since construction of the streetcar tracks began in April 2017. Though the streetcars are not set to begin running until November 2018, there is widespread concern among bicyclists and motorcyclists about the inability to turn across them at right angles when changing lanes or moving to avoid a hazard. Vehicles with small wheel diameters or narrow contact patches are especially at risk, including mopeds, scooters and special-needs mobility devices. Founded in 1969, the law firm of Hupy and Abraham, S.C. has a long history of support and presence in the motorcycling community. Attorney Hupy, a lifetime ABATE of Wisconsin member and longtime motorcycle awareness advocate, has a proven record of success with large settlements in serious cases. Some of Attorney Hupy’s notable cases include a $5 million result for a 16-year-old who was hit by a truck in Milwaukee, an $18.2 million settlement after a trial against the federal government and a $1.1 million verdict for an injured Wisconsin motorcyclist (which became the largest settlement in Milwaukee County for that year). Having collected over $1 billion in verdicts and settlements, the law firm of Hupy and Abraham has 11 offices across Wisconsin, Illinois and Iowa. The firm is proud to provide superior client care in a variety of personal injury-related categories, including car accidents, motorcycle accidents, dog bites and nursing home abuse and neglect. The firm provides free 24-hour consultations, and a variety of FREE safety materials for motorcyclists, bicyclists, drivers and pedestrians.